“But, mistress, someone has already invented the gauntlet,” said the prime minister when the princess made the announcement. The upshot of all this is that only he who presented the golden apple to the princess would be able to marry her. Of course, suitors from all over the kingdom came and tried their luck, but none of them got very far. In fact, none of them got past the Haunted Forest. Most ran straight out of the forest in fear, and one or two got lost and were never heard of again. Then there was one guy who snapped almost immediately and decided to live in the forest with the ghosts. He became known as the Ghost Man of the Haunted Forest, but that’s another story. The princess was just beginning to think that nobody would be able to run the Gauntlet when Doug announced that he would attempt to recover the Golden Apple. Doug was not the tallest, strongest, fastest, bravest or handsomest man in the kingdom. In fact, he was widely considered to be just sort of…ordinary. Just a normal guy. A nice guy, mind you, but normal just the same. And after knights and princes and lords and other guys with fancy names had all failed to retrieve the apple, the princess felt sure that Doug would fail, too. So bright and early one spring morning, Doug entered the Haunted Forest armed with nothing but a spool of thread, his trusty fiddle, some hard candy, a handkerchief and a cheese sandwich. The first thing he did upon entering the forest (which was dark as night, despite it being bright and early in the morning) was to take a branch off one of the trees and tie his handkerchief over his eyes. You see, Doug knew that ghosts can’t really hurt you, just scare you. And if you can’t see them, you can’t get scared. So, feeling his way through the trees with the stick, Doug made it past the ghosts and straight to the center of the forest, where the phoenix was known to dwell. It just so happens that a phoenix’s favorite food is a cheese sandwich, so the majestic bird walked straight up to Doug, saving him the trouble of catching it. Well, that was a sweet deal the Phoenix couldn’t refuse so, before he knew it, Doug was on top of the Misty Mountain with no cheese sandwich, but with a phoenix feather, which is really what he needed anyway. So armed, he bravely marched into the giant’s cave. So Doug took the elevator to the base of the mountain where it was just a short walk to the maze. As luck would have it, there was a tree just outside the entrance to the maze. Doug tied one end of his spool of thread to the tree then entered the maze. Using the thread, he was able to keep track of where he was and where he’d already been, so it was easy to solve the maze and reach the center where he opened the box with the key and took out the golden apple. Then all he had to do was follow his thread back to the tree and he was out of the maze with the feather, the key and the apple. He put them in his pack with his other possessions…then went home. He never even spoke to the princess. And why should he? Who would want to marry someone who makes her potential husband go through all that? What kind of person is that arrogant? The apple was clearly addressed to “The Fairest of the Fair” and that was not the princess. So Doug just took the apple home, hoping one day to meet someone who did deserve it. As for the princess? Well, as far as I know she is still waiting for someone to bring her the golden apple…and if you don’t tell her I won’t! 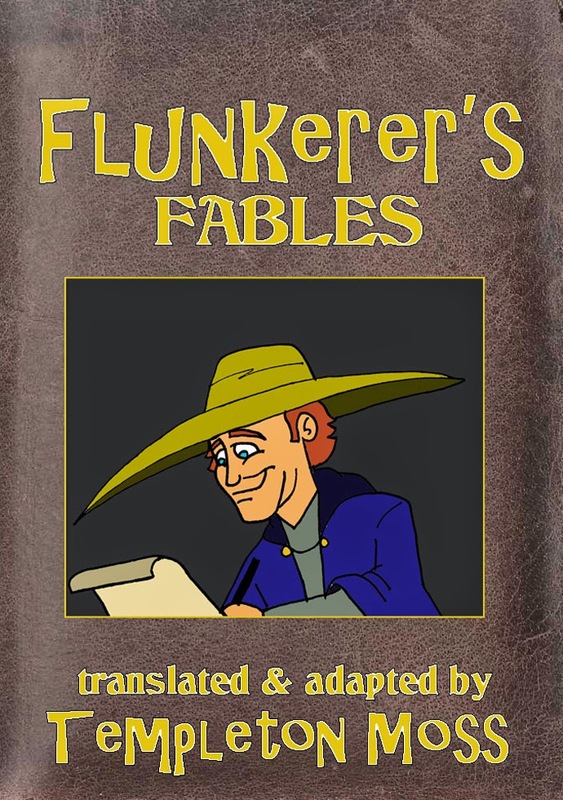 If you enjoyed this "Flunkerer's Fable" why not buy the book HERE and learn all about this forgotten hero of fairy tales? They were always trying to one up each other. When they went fishing, “I caught a much bigger fish than that!” At the dinner table, “I can eat more suckling pig than you!” When they were playing games together, “Ha! You landed on Marvin Gardens with two hotels! You’re bankrupt!” For some reason known only to the royal psychiatrist, the princes three were each obsessed with being the very best. One day, their father told them that they must go out into the world and find brides. So the brothers set forth in different directions to seek out awesome girls to marry. Christopher went North, David went East and Matthew went sort of Southwest, that is, he started West then veered slightly South and then he curled around to…never mind, the point is they went out and looked for girls. Christopher, the eldest, went North to the mountains and arrived at the village of Neun where he announced that he was looking for a wife, and that she’d have to be pretty awesome to marry an awesome prince like him. Now, the good news is that the ruler of Neun did in fact have a beautiful young daughter called Princess Billie who was lovely and fair and graceful and had golden blonde hair and the bluest of all the eyes ever. The bad news is that at the moment, she was not available. “And why is she not available?” demanded Christopher. The ruler of Neun said he would give Christopher permission to marry his daughter if he could rescue her from the ogre. To aide him in his quest, he gave the prince three magical items. The first was a gold ring with a red stone which would protect him from the ogre’s hypnotic gaze. The second was a sword which had once been stepped on by an old, nearsighted cow, which according to local legend, meant it was magic somehow (not all local legends are totally reliable, you know). And finally, a pair of really great athletic shoes which offered great arch support and padding, but which were so lightweight that it felt like Christopher was in his bare feet. These weren’t really magic in the strictest sense, but c’mon! How hard is it to find a really great pair of sneakers that don’t cost an arm and a leg? Seriously! Armed with his new thingies, Christopher strode confidently into the ogre’s cave. His sword drawn, he marched bravely into the cave where he did, indeed, find the princess…who had just finished defeating the ogre on her own. Anyway, they went on like this for a while and finally decided to share the credit. They went back to Billie’s father and told him that Christopher had arrived just as the princess had sprung into action, and they worked together to defeat the ogre. This seemed to satisfy Billie’s father and he gave his blessing. So Christopher headed for home with his bride-to-be, the strong and beautiful Billie. David, the middle son, went East to Zehn, one of those countries that someone decided to build in a the desert for some reason. Just as Christopher had done, he announced to anyone who would listen that he was looking for a really cool girl to marry. And, sure enough, the local Sultan had a beautiful daughter called Freema. She was dark-eyed, dark-haired, dark-skinned and oh-so-beautiful. She was lythe and athletic and also happened to be the finest dancer in the country, known far and wide for her infamous Dance Of The Six And One Half Veils. It was one of those belly-type dances where girls’ hips look like they’re made of rubber. “What must I do to win your daughter’s hand in marriage?” asked David. “We shall play chess!” announced the Sultan. And so it was that David had won the Greatest Game Of Monopoly Ever and won the hand of the beautiful and exotic Freema. Matthew, the youngest of the three princes, had heard an old legend about a place called the Elf Islands where beautiful women lived, just waiting for handsome young princes to come and carry them away. So, he went to the type of bar where sailors usually hang out and announced that he was planning a trip to the Elf Islands. When he said this, everyone gasped. And so, with a crew of surprisingly stupid sailors, Matthew set sail for a group of dangerous islands in the hopes of marrying a mermaid. Yeah, he’s a nice guy, but not a lot going on upstairs, if you know what I mean. Soon (by which I mean about a month later) the islands were in sight. Matthew gave the command to land the ship at the nearest island and called for a fishing net so that he could catch a bride. Matthew was beginning to consider giving up and just going home when he heard a beautiful sound. A voice far too beautiful to be human, singing a song that was, at once, beyond his comprehension, and yet so crystal clear that it made him want to weep. Soon, he and all the sailors were leaning over the railing into the water. Sure enough, the ship was entirely surrounded by beautiful maidens floating in the water and singing. Most of the crew were hardened old seadogs, so they had enough sense to ignore the siren song and restrain some of their younger shipmates. Matthew, however, has been established as sort of foolish, which is why, mere seconds after being told about the treacherous mermaids, he dove into the water. But here’s the thing about mermaids: They can’t eat your soul if you haven’t drowned. And there are two ways to avoid drowning if you’re underwater. The first is to be a fish. The second is to have received the legendary Mermaid’s Kiss, which allows the recipient to breathe under water. After nearly an hour of trying unsuccessfully to drown Prince Matthew, the mermaids finally gave up and tossed him back onto the shore like a fish that was too small. Which is howcome Matthew survived and he and his crew turned the ship around and headed home…with one additional passenger: the gentle and mysterious Princess Karen. 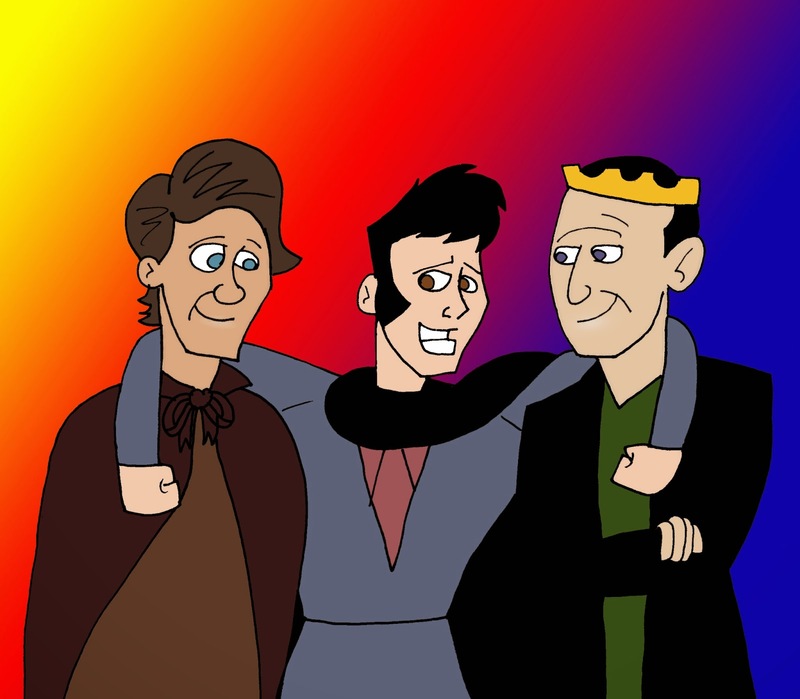 And so, all three princes returned home and there was a grand and glorious triple wedding. Christopher married Billie, David married Freema and Matthew married Karen. Indeed, everything was all set for one heck of a mega happy ending…except for that nasty competitive streak I mentioned back when this ludicrous story began. Of course, we know that this was the silliest thing in the world to argue over, but for some reason, the princes were determined to settle it once and for all. Which is why they decided to go on another quest, together this time, and seek out the Witch of the Mirrors. Legend had it that in a tiny cottage deep in the forest lived a witch who did nothing all day but make magic mirrors and play the lottery. In two hundred thousand years, she hadn’t won so much as ten bucks, which is why she had so much time to make mirrors. And why were they seeking the Witch of the Mirrors? Because another legend had it that there was a Mirror of Truth which would answer any question asked truthfully and which never failed to give an answer to any question. So they would simply stand before the mirror ask “Which of our wives is the most beautiful?” and her face would appear before them, thus solving the question once and for all. Unfortunately, no one knew where the Mirror of Truth was. But they figured the Witch was a good place to start. And so, despite the protests of their beautiful new wives, the three stupid princes went forth to find the Witch of the Mirrors to find the Mirror of Truth to find the…whatever, you know the bit. After two long days of traveling, the princes found the cottage of the Witch of the Mirrors and knocked on her door. Excited to have company for once, the Witch let them in. She showed the princes her impressive collection of magic mirrors. One showed you what you would look like when you were a hundred. One could show you any event in the past that you wanted to see. One of them made you look all bendy and distorted (it was essentially just a fun house mirror). Then there were some that were traveling mirrors. Matthew stepped into one and came out through a mirror on the other side of the hut. The princes thanked the Witch and traveled to the old haunted castle of her cousin, Phil. They knocked on the giant doors, which swung open as if under their own power. Swords drawn, the princes stepped carefully into the dark corridor and the doors slammed shut behind them. Then the walls of the corridor lit up with long lines of candles that stretched all the way to the end of the hall. They followed the candles (which went out as they passed) until they reached the throne room. There was Phil, seated on the throne. “Any you care to name,” said David. Imagine their surprise when they found themselves back in the home of the Witch of the Mirrors. It was clear that though they had asked the same question and were all looking at the same mirror, each prince was seeing a different image. They were each seeing their own wife smiling back at them. They were, in a word, confused. And that’s how the princes three learned that sometimes in life there was no biggest or best, there was no winner. Sometimes things were just different. Not better, not worse. Just different. As far as each of them was concerned, they had married the most beautiful girl in the world, so what else mattered? Finally, the brothers returned home to their wives who were, don’t get me wrong, a little annoyed at their husbands for wasting all that time on such a stupid wild goose chase, but they had also gotten to know each other very well in the meantime and were now closer than sisters. As for the Witch of the Mirrors, she eventually did win the jackpot and retired from mirrormaking once and for all. Today she is known as the Witch of the Large Amount of Money. And our Princes Three? They of course lived happily ever after. 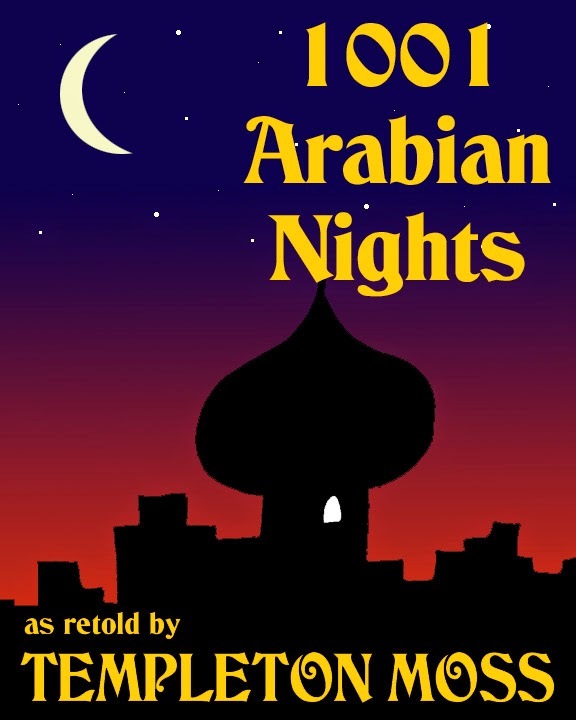 Adapted from the Arabian Nights fables. It was many, many years ago, when I was a much younger man. I was a sailor then, and had hired myself off as a crewman to a mighty vessel called...well, I don't remember. Bill or something, who knows? The point is, there was another sailor on board that ship and at night, he would tell us all the amazing story of his adventures on the seven seas. “Which, as it turned out, was not an island, but rather a giant whale which immediately began swimming away with me on his back! “I finally managed to get away from the whale and, come nightfall, found myself alone on a desert island. I stayed there for several days, eating the fruits and herbs that grew there and drinking from a stream. I was beginning to give up hope that I would ever get home, and began to despair of ever finding my way home. “A giant bird coming out of the sky to sit on her giant egg. “I saw at once a chance for escape! I unraveled the turban on my head (apologizing to Allah as I did so, but desperate times call for desperate measures) and used the linen to tie myself to the bird’s leg. Soon the bird took off (no doubt to gather food for its soon-to-be-hatched offspring) and flew away with me tightly bound to her leg. I didn’t know where we were going, but I assumed, as we began to land in another country, that anyplace was better than where I just was. “I was wrong...very, very wrong. “Upon untying myself from the bird I realized that she had left me on the floor of the Valley of Diamonds. Those of you who have heard the legends will know that the good thing about the Valley of Diamonds is that the floor of the valley is, of course, covered with the biggest, purest diamonds you’ll ever see. The bad thing of course is that the walls of the valley are so steep that you will never be able to climb out. “And even if you could climb out, the rest of the country’s not exactly hospitable either. Huge serpents, birds bigger than the one that carried me, savage beasts and…the giant! “The giant is as tall as forty men and has skin as black as pitch and only one giant eye in the middle of his face. And every night, he searches the valley for men who have climbed in looking for wealth only to find death. When he reached out his hand to grab me, I quickly filled my pack with as many diamonds as I could before he took me to his cave and dropped me into a cage with two of my countrymen, fellow travelers named Bakbarah and Alcouza. “‘Not too hard for these,’ I said, opening my pack. Diamonds, of course, are the hardest things in the world, so it was no trouble to break through the bars while the giant was taking a nap. Then we went to the fire place and took a long piece of wood which was still smoldering at one end and drove it into the giant’s eye. He screamed in pain and started clawing around in blind fury, but we were long gone! “My new companions and I ran for the seashore as fast as we could, just in case the giant was following. As luck would have it, a ship had stopped to gather provisions and happily brought us aboard. Unfortunately, our first night on the ship we ran into a terrible storm and I was, once again, cast into the sea where I spent a full day and night floating on a plank of wood before washing up on another desert island. “But I wasn’t alone for long this time, as some very elegantly dressed men and women found me and brought me to their magnificent city of Karamesh and their great King Miraghe, who ruled over the entire island. I was welcomed by the king and soon became a favorite among his courtiers when I told the stories of my many adventures. And, when I observed that neither the king nor any of his subjects used saddles, stirrups or bridles when they rode horses, I described them to the royal craftsmen and had a complete set of riding accessories made for the king. Soon it caught on and, thanks to me, everyone in Karamesh was riding much more comfortably. “‘Of course, your majesty, anything you want,’ I said, stupidly. “‘I want you to marry my daughter. That way you can stay here forever and never return to your own home.’ Well, lovely though his daughter was and pleased though I was to be popular among the court, I couldn’t very well stay there forever, so I declined…the king did not take my refusal very well…he made a pointed argument in favor of my staying…I remained resolute…long story short, I soon found myself running away under cover of night. “For a full week, I lived in the jungle, hiding during the day in case the king’s men found me and eating only what I could find. One day I heard human voices talking, and I hid in the branches of a tree until they had passed. To my surprise, however, they were not the voices of King Miraghe or his subjects, but voices I had heard before. “‘Sinbad?’ My friends embraced me. The captain of the ship that had so recently rescued us had been searching for me ever since, and my loyal friends, who perhaps felt they owed me a debt after I helped them escape the giant, volunteered to search every island in the area until I was found. So now we were set to return to the ship and bid farewell to Karamesh once and for all. 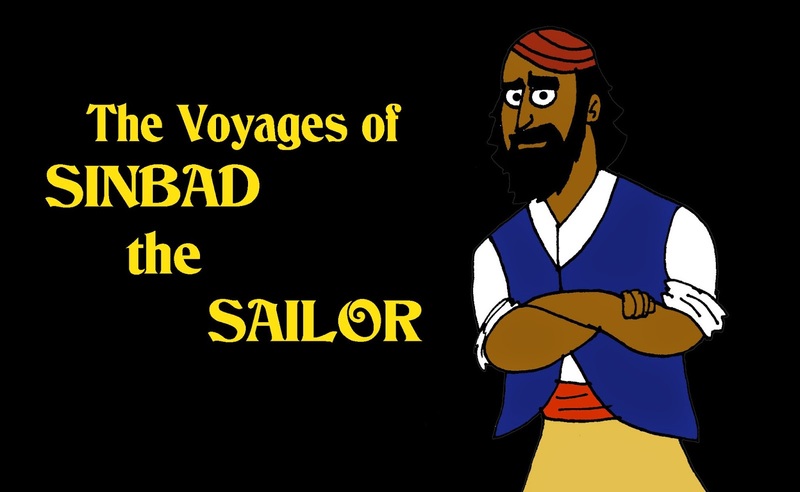 Sinbad's story is just one of many told by Scheherazade to the Sultan in the classic 1001 Arabian Nights. I have selected the best bits, taken out the long, boring, repetitive parts (which, while perfectly reasonable from an overall plot standpoint, do tend to make for some pretty tedious reading) and put them together in my own version of the book which you can purchase HERE.